Watercolor Flowers and bubutterflies with a mosaic texture on this elegant spring or summer wedding suite collection. Modern border pattern to surround your important information with pretty flowers of pink, white and yellow. The matching wedding stationery set includes everything you will need to go with that guest invitation. Add your couple’s photo to give it that unique personalized touch; then continue with this scenery of nature for the reception. This a beautiful theme on the guestbook and table cards. Add more products to your collection when you go directly to the Butterflies & Flowers in Mosaic Wedding here. Click on the colored link and images to go to the wedding products. 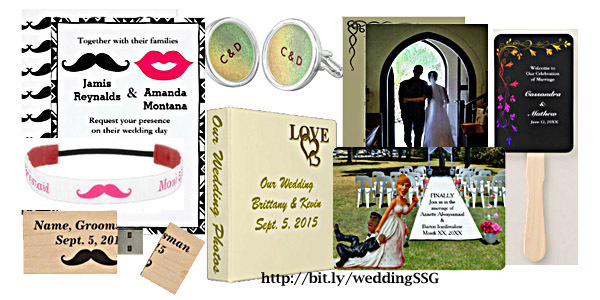 Wedding stationery sets come in a wide variety of styles and designs at Sandyspider Gifts. These collections will take you from the “Save the Date” to the wedding invitation and reception party. An example of wedding sets, come in matching announcement cards, RSVP cards, registry list, programs and more. It does not end with the card products. The Mustache and Lips theme has gifts for the bridal and groom teams. 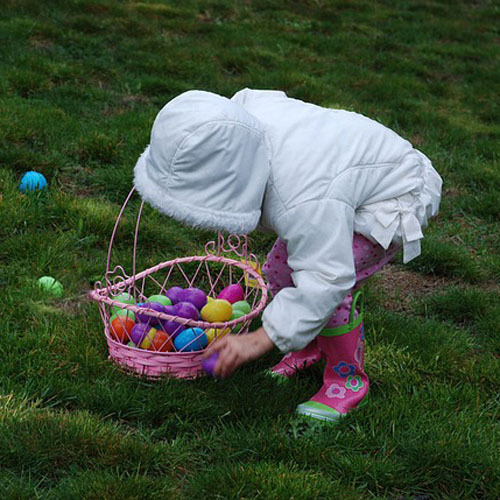 This celebration has themes for the seasons from winter to summer. Enjoy a funny design. Or elegant ribbons and bows, lace and flowers. Any of these products can be customize to add your own pictures or artwork. Make it uniquely you. Add the photo of the happy couple for the engagement announcement or wedding invite. Our shop is located on the Zazzle site. Send a message to admin@giftsyoutreasure.com for questions or a custom product. Contact us if you see something outside our shop. A special link will be sent. The picture above is a sample shown within the store wedding category or collections of wedding cards and gifts. All these are set up to transfer the image and text to other products. 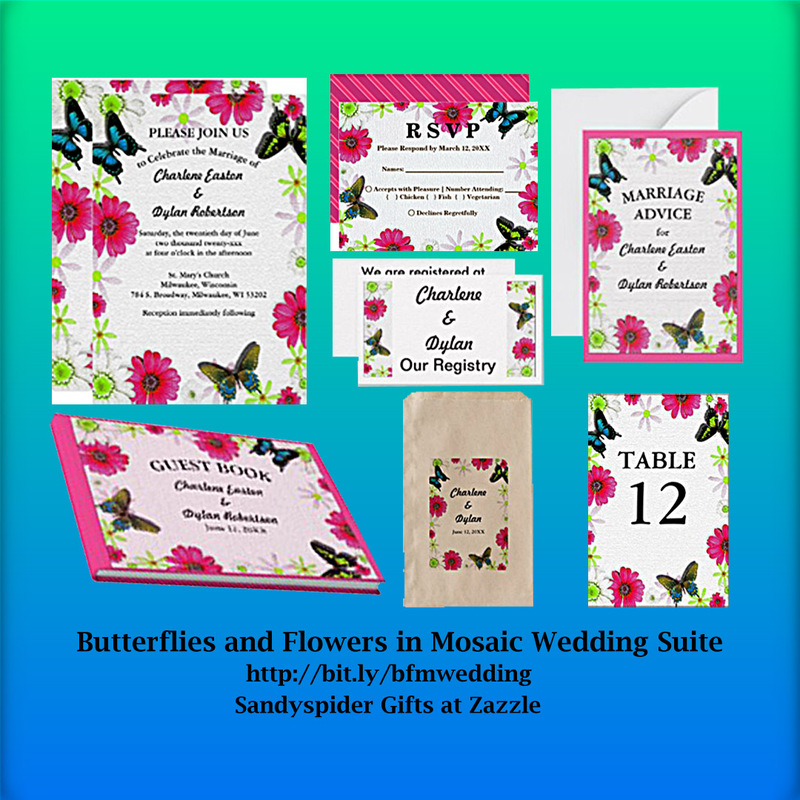 Wedding products from other designers are here at Zazzle. Please leave a comment so I know you have visited. If the area does not show up, click on the "No Comments" to open up the comment area. Thanks! There are so many fun pineapple designed products from clothing (t-shirts, tank tops, leggings, and shoes) to home decor (posters, clocks, duvets, lamps, and pillows). The pineapple is symbolic for a house warming or a nice tropical day. Then again, a pineapple is a fruit of the tropics. Rich in vitamin C. It's yellow fruit color reminds me of a bright sunny day. As a designer on many online print-on-demand stores, the pineapple looks amazing as a stand-alone design. Or as a funny character with sunglasses to make it more human-like. You can decide by some of these gift items below. More are available at Sandyspider Gifts: Pineapples. Note: If you scroll down from each product page to the "About This Design", you can see how many products the design image is on. Plus you will also be able to transfer the image to other products. For transfer designs, you will need to customize the image to fit properly on the product. Also, note that it is better to transfer from a larger product than from a small one for best results. Example: transfer the design from the poster to a t-shirt, rather than a card to a t-shirt. Some pineapple style posters, clocks, duvets, lamps, and pillows (in order). Click on the images to visit the product page. The duvets made are for king size. Twin and Queen are also available. Many sizes for posters and three clock styles. When choose a different style, please customize and resize the image to fit properly. Contact me at admin@giftsyoutreasure.com for a custom gift or questions. Bring out the Irish with a little green card. Send someone you love a pot of gold in a greeting card. These are fun to give out to friends and family for that special holiday. Share a little joy, luck and cheer. No need to be Irish to celebrate St. Patrick's Day. Personalize any of these cards with your own message. Add your photo and even change the image design. The cards from Zazzle makes it so easy to do. Customize the cards to a different size from a smaller card to a big card. There are even jumbo cards when you click on the "Transfer this design to another product". Note that not all products will fit each design image. The product page will give a warning message if it does not fit. No need to worry. Enjoy these cards and hand out the luck of the leprechaun. 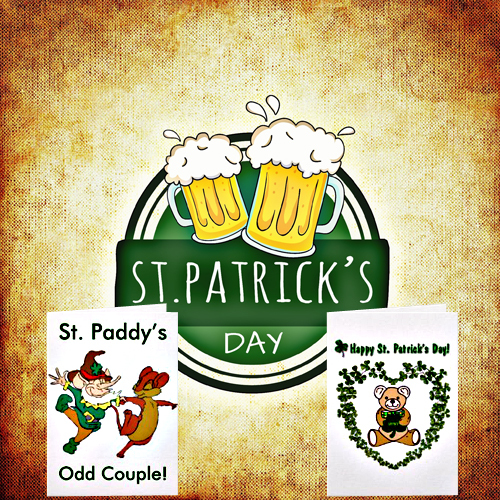 The St. Patrick's Day cards images and colored text below will bring you to the secure Zazzle pages where these are located. St. Patrick's Day cards with the Irish women, a boy, Erin's Isle Map, Irish men, the harp and more. Click on the images and colored links to check out. St Patrick's Vintage Cards includes postcards and greeting cards. Modern day design cards with teddy bears, shamrocks, leprechaun and Irish patterns. Modern St Patrick's Cards includes postcards and greeting cards.